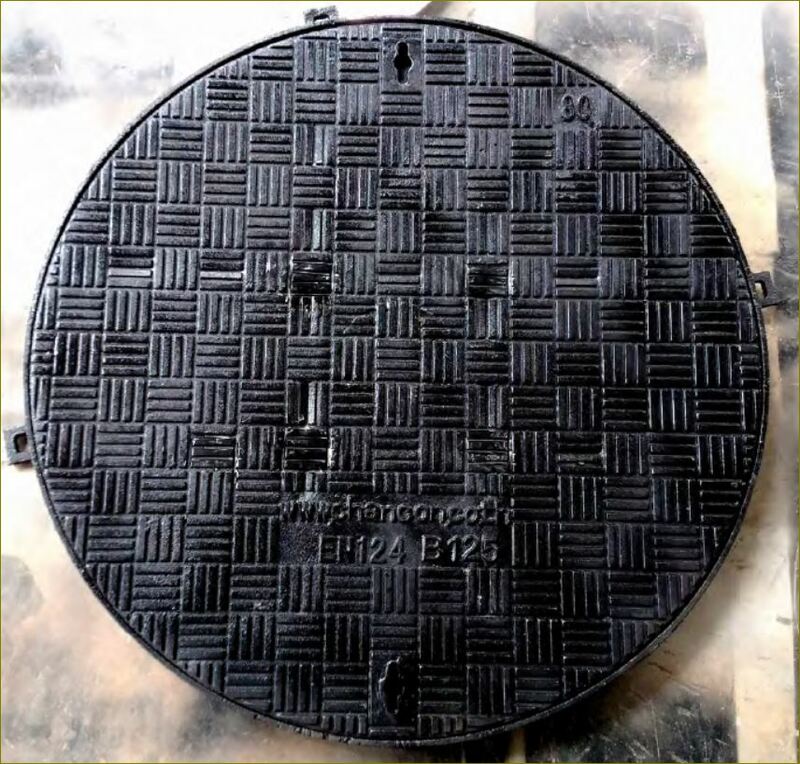 A manhole cover is a removable plate forming the lid over the opening of a manhole, to prevent anyone or anything from falling in, and to keep out unauthorized persons and material. 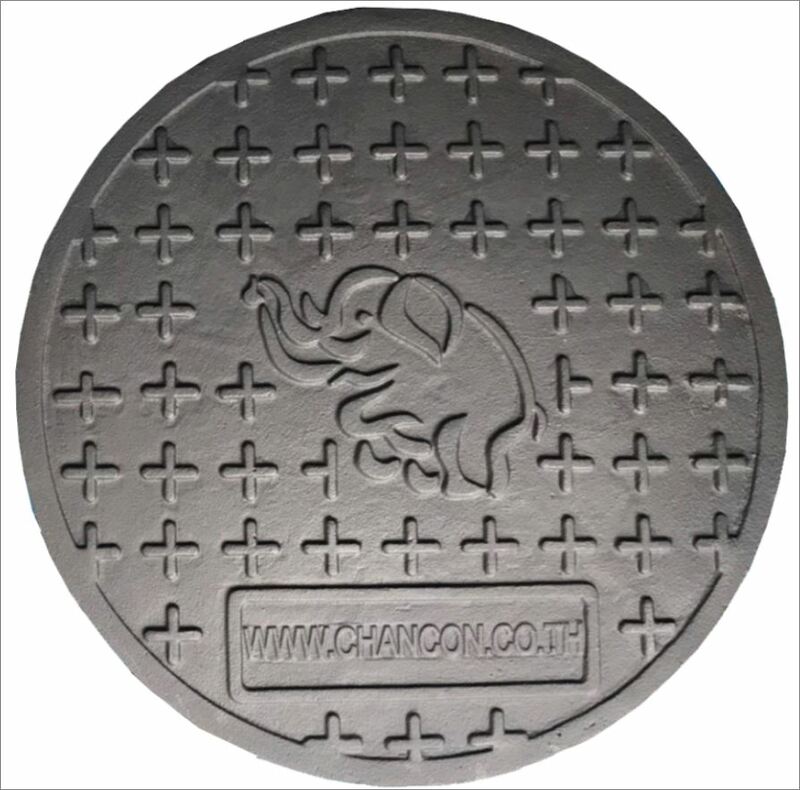 Manhole covers are often made out of cast iron, concrete or a combination of the two. 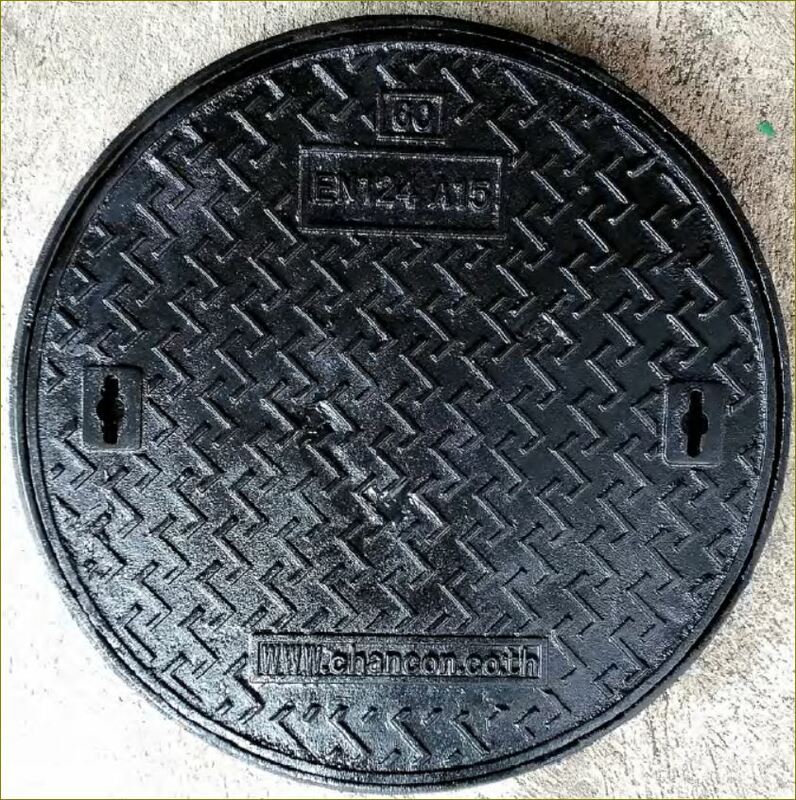 This makes them inexpensive, strong, and heavy. 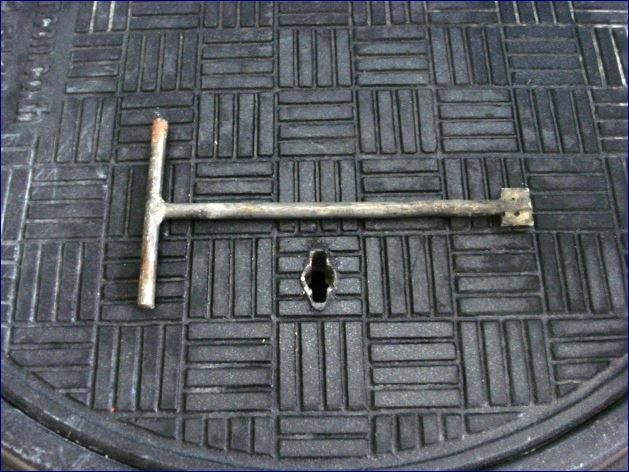 The weight helps to keep them in place when traffic passes over them, and makes it difficult for unauthorised people not having suitable tools to remove them. 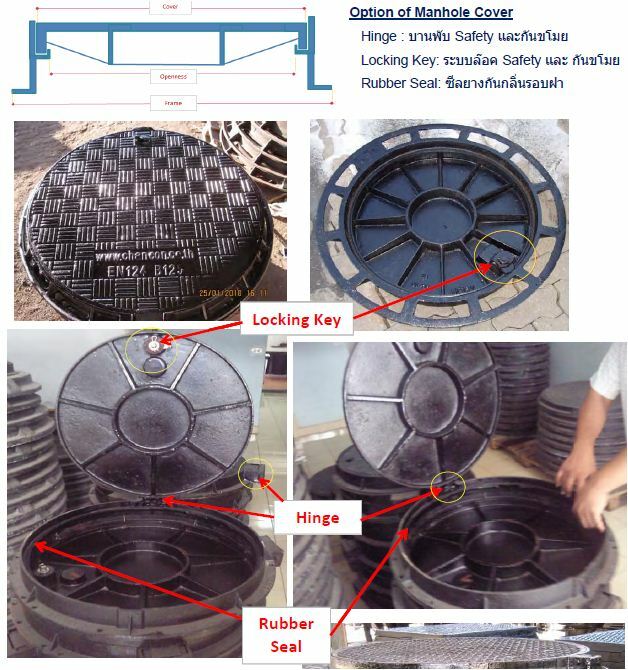 Manhole covers may also be constructed from glass-reinforced plastic or other composite material (where cover theft is of concern). 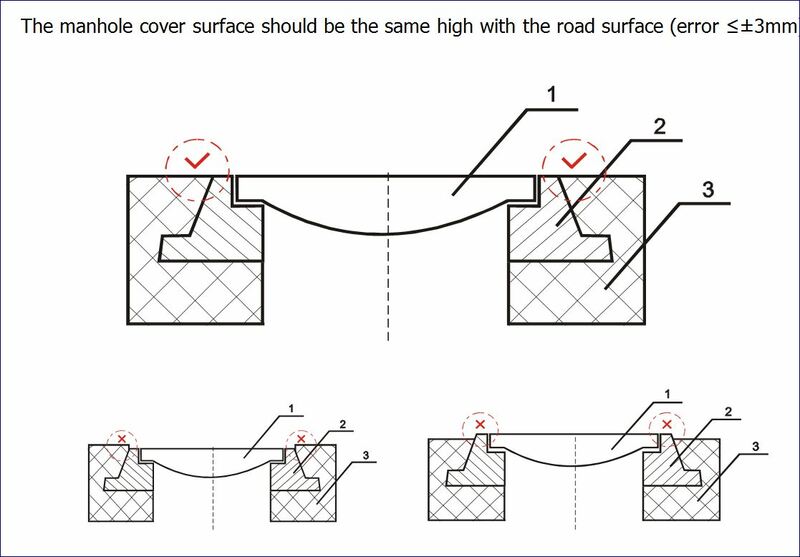 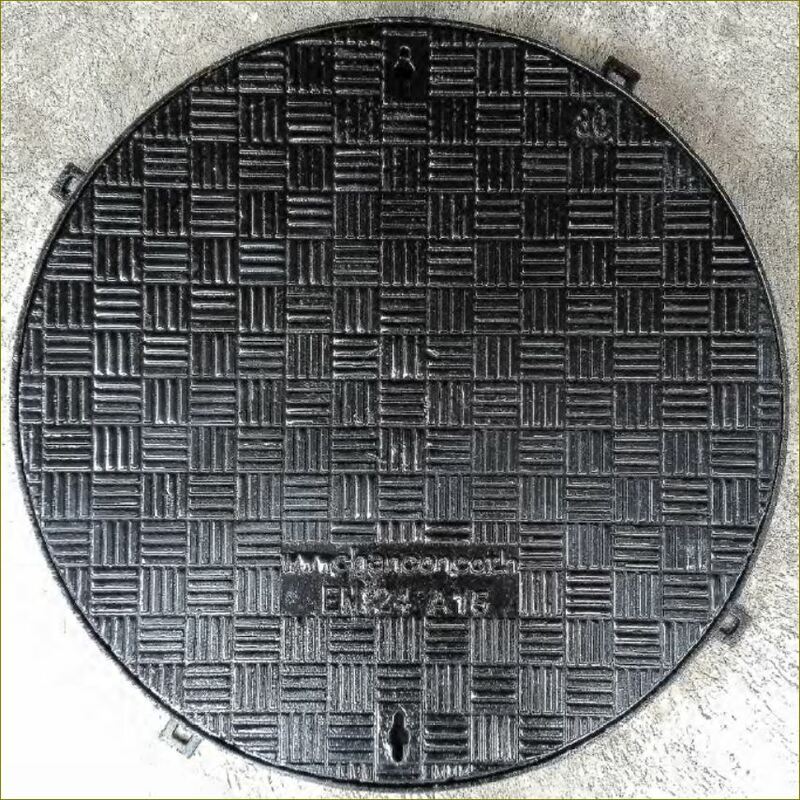 Because of legislation restricting acceptable manual handling weights, lighter weight composite manhole cover materials, which also have the benefits of greater slip resistance and electrical insulating properties. 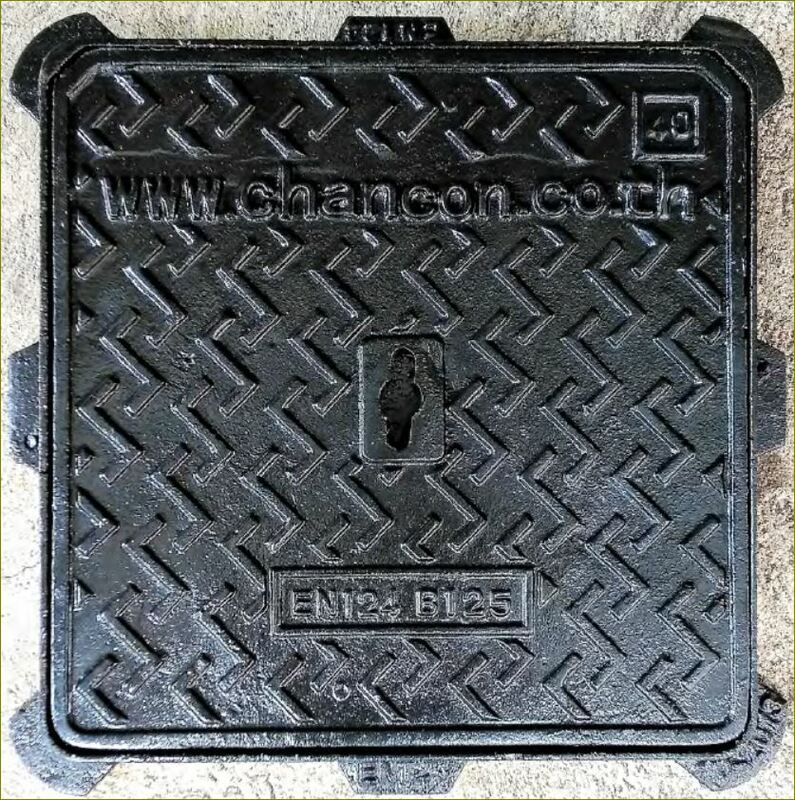 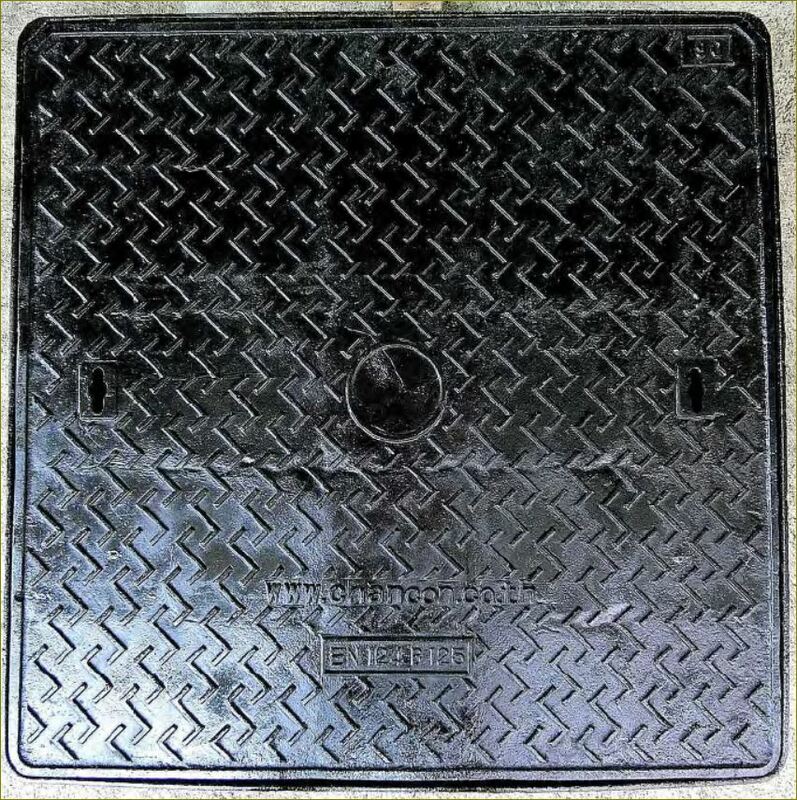 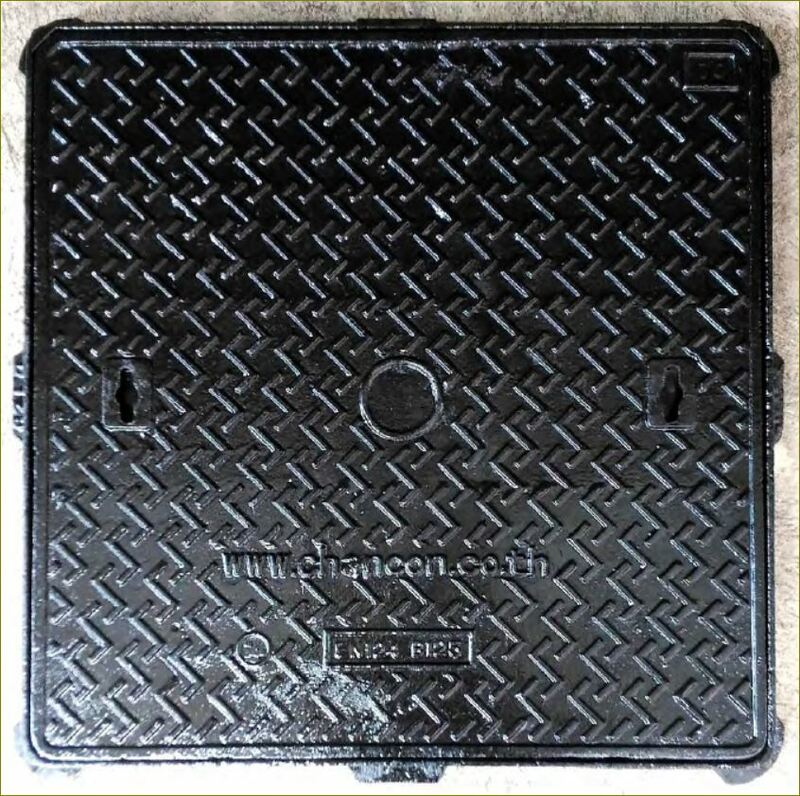 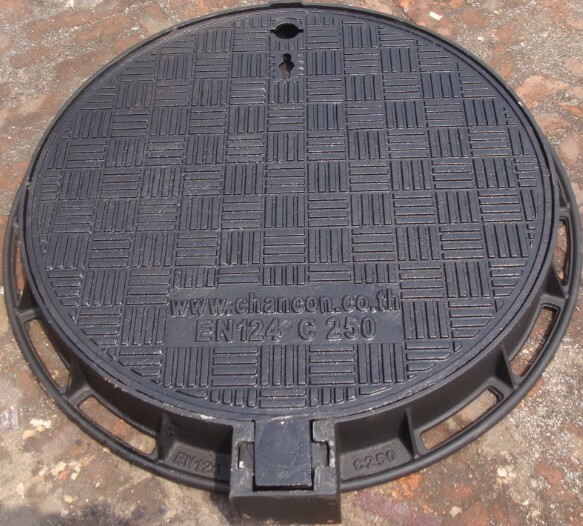 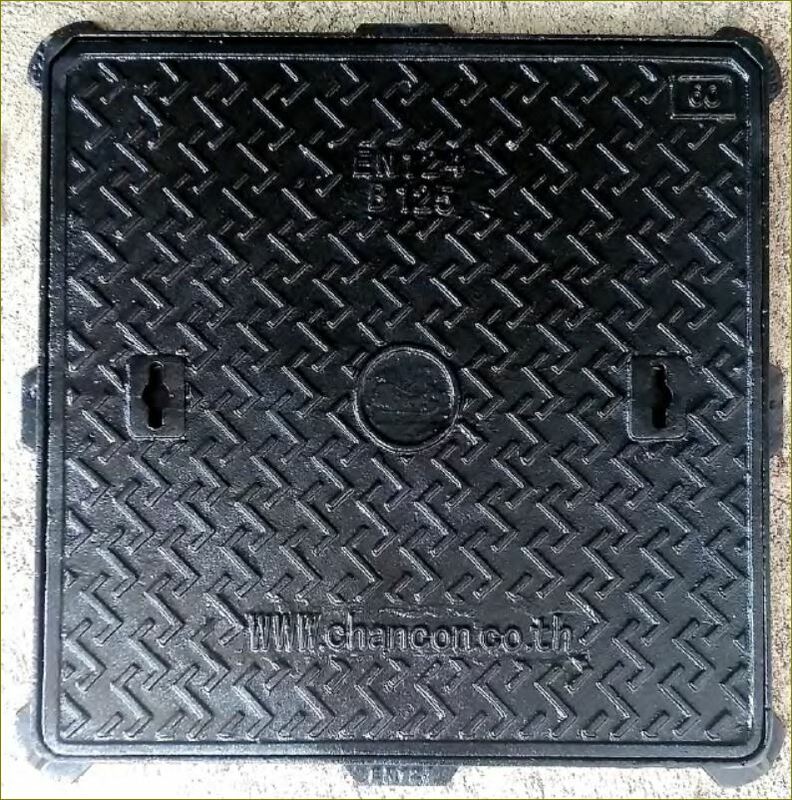 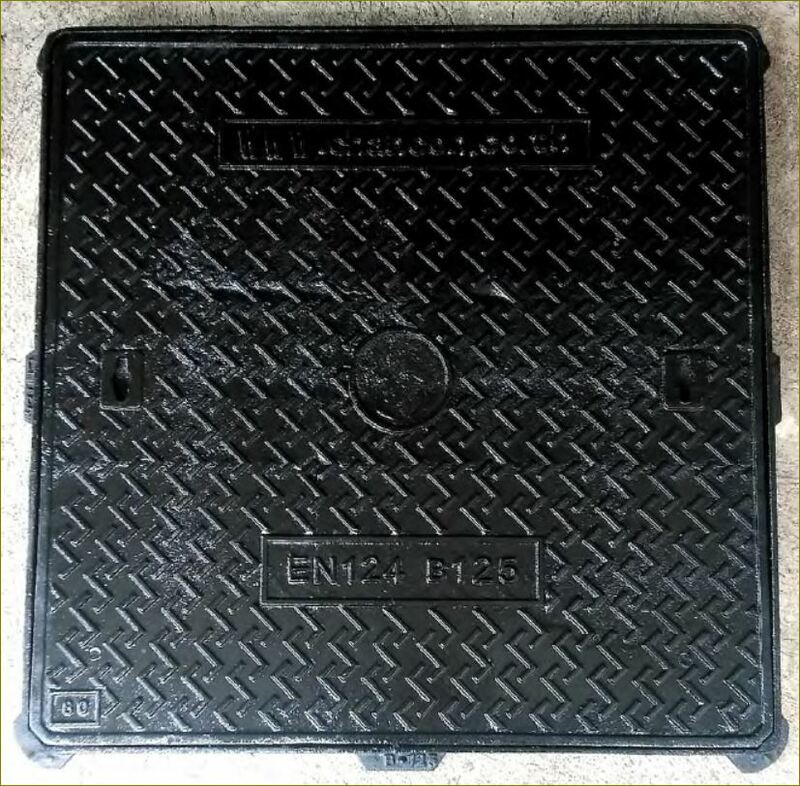 A manhole cover sits on metal base, with a smaller inset rim which fits the cover. 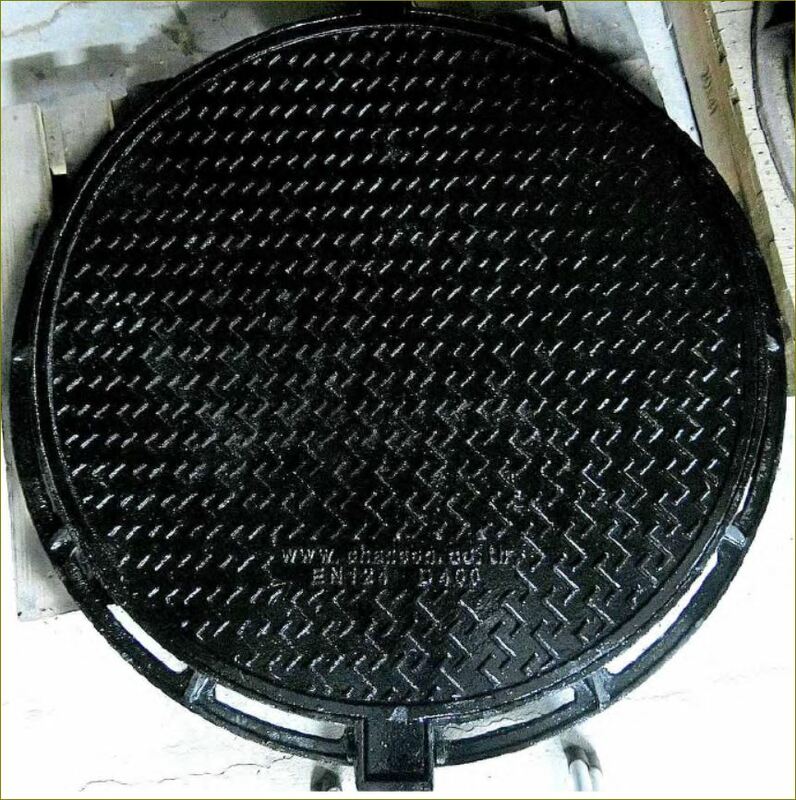 The base and cover are sometimes called "castings", because they are usually made by a casting process, typically sand-casting techniques. 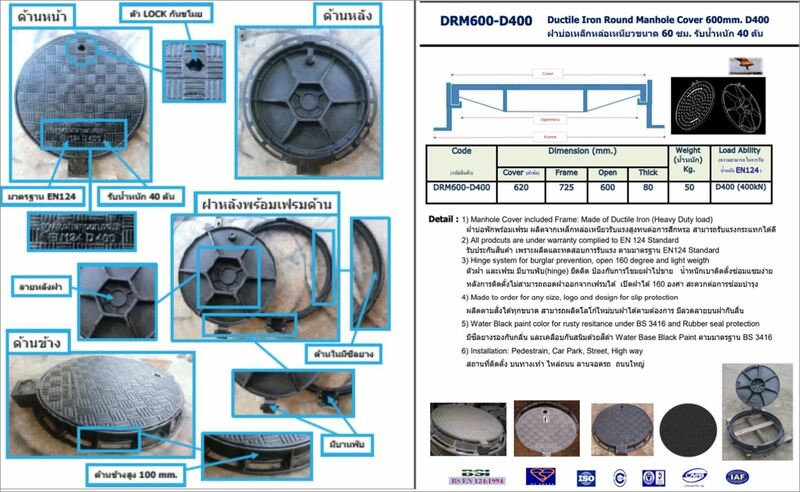 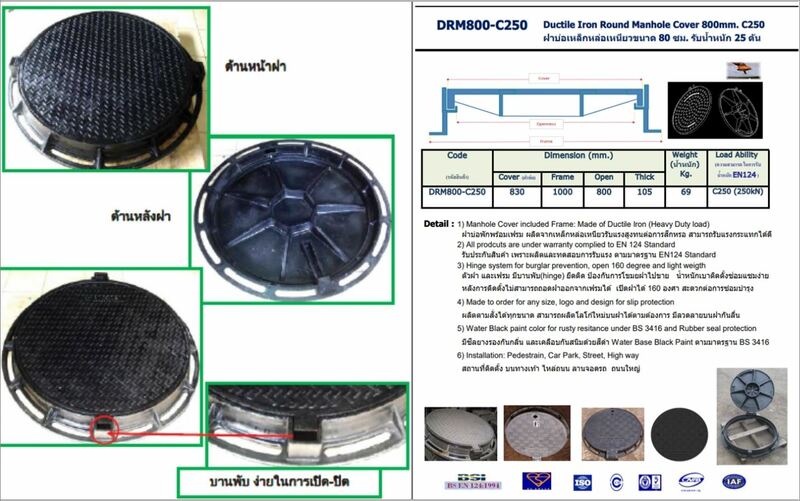 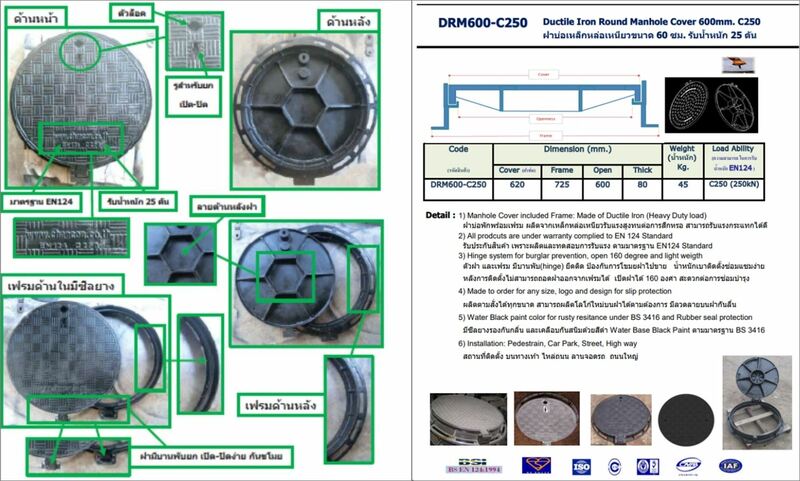 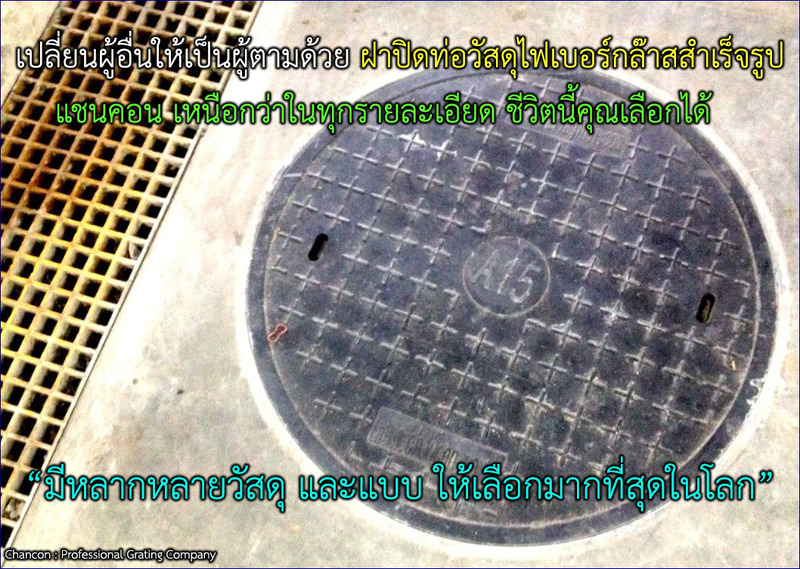 A round manhole cover #ฝาปิดท่อระบายน้ำ #ฝาบ่อพักเหล็กหล่อ #ตะแกรงไฟเบอร์กลาส-ฝาบ่อเหล็กฝาท่อ #ManholeCOVER #Grating has a smaller surface than a square one, thus less material is needed to cast the manhole cover, meaning lower cost. 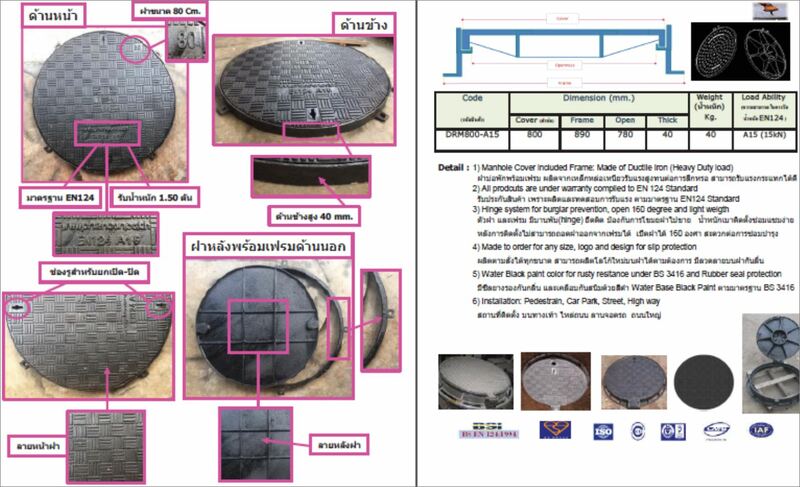 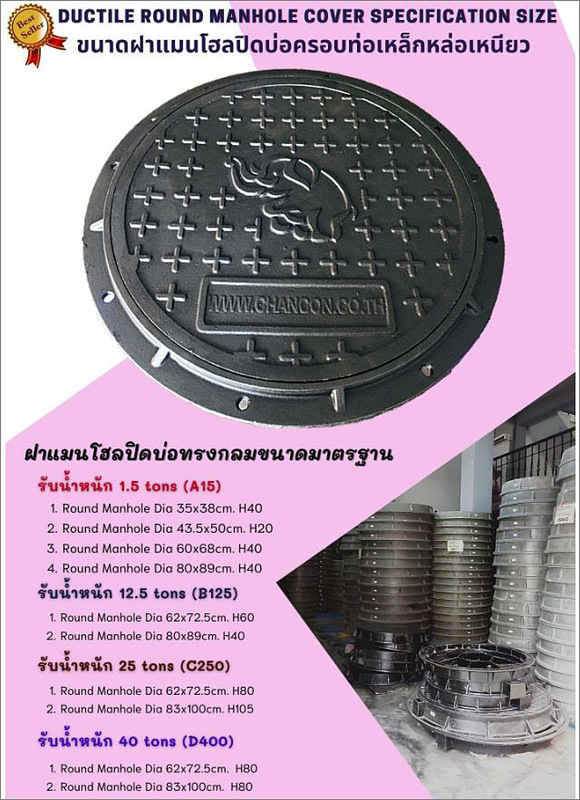 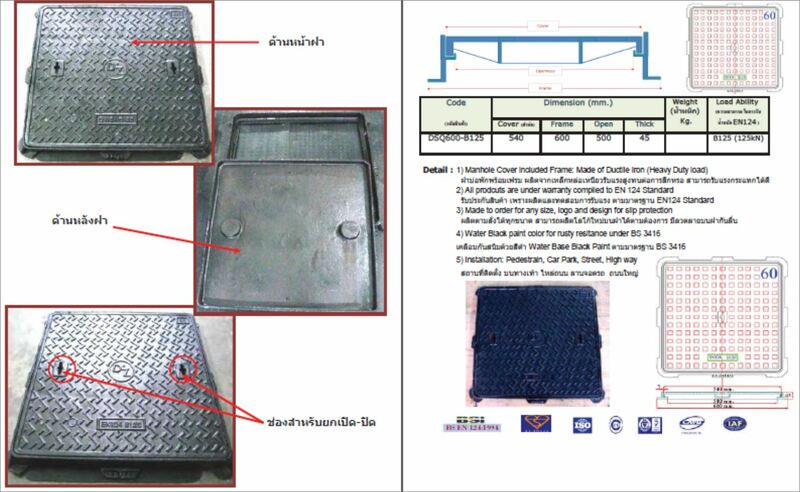 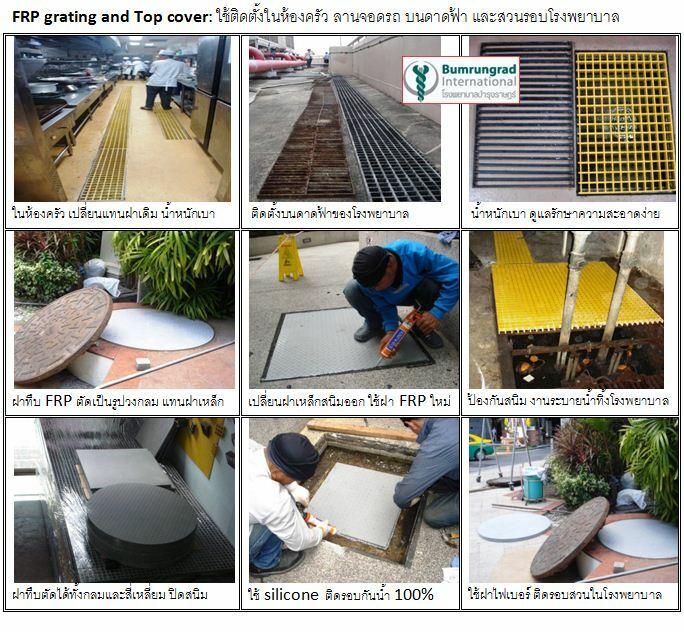 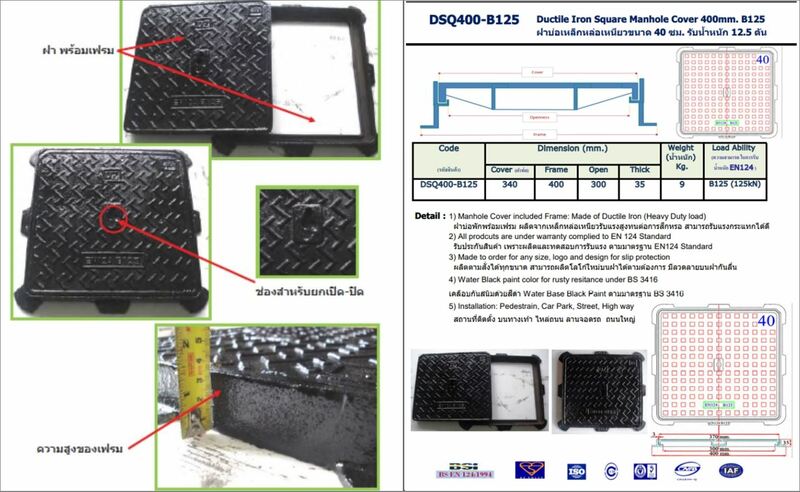 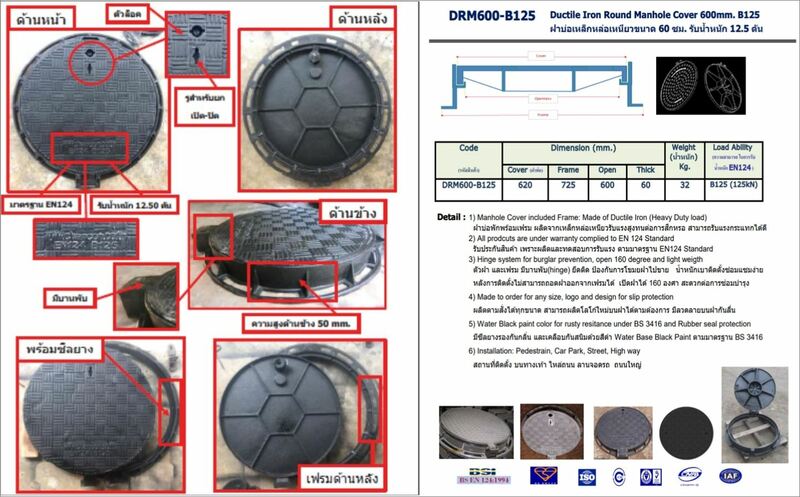 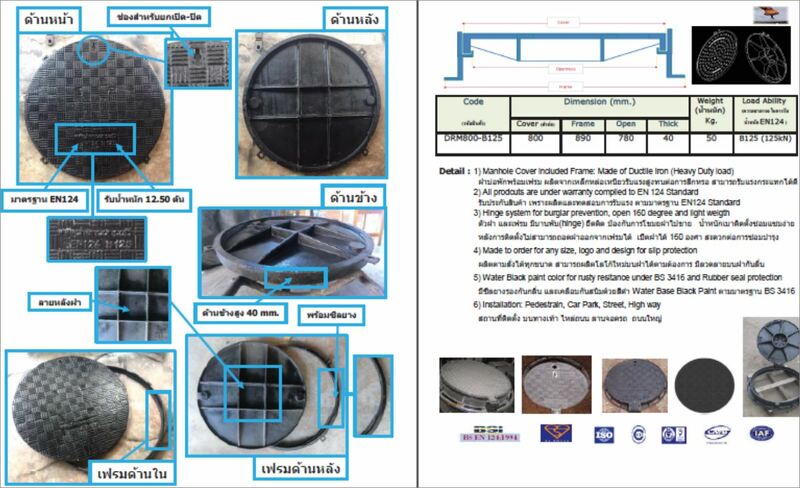 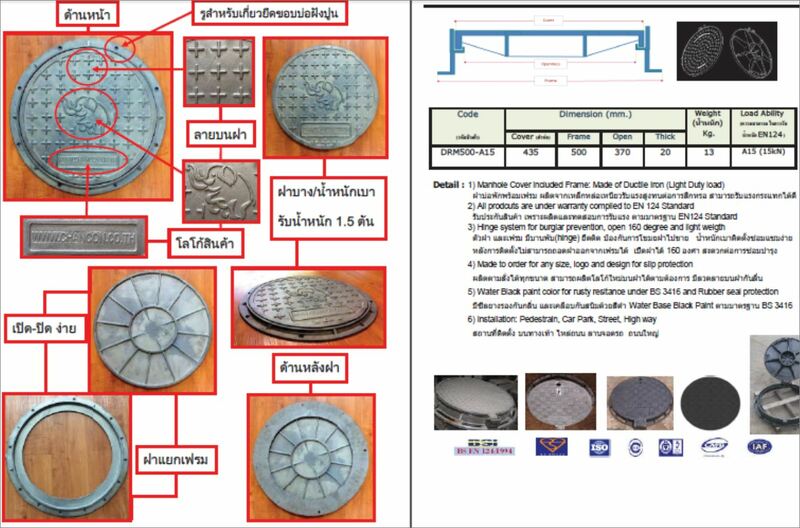 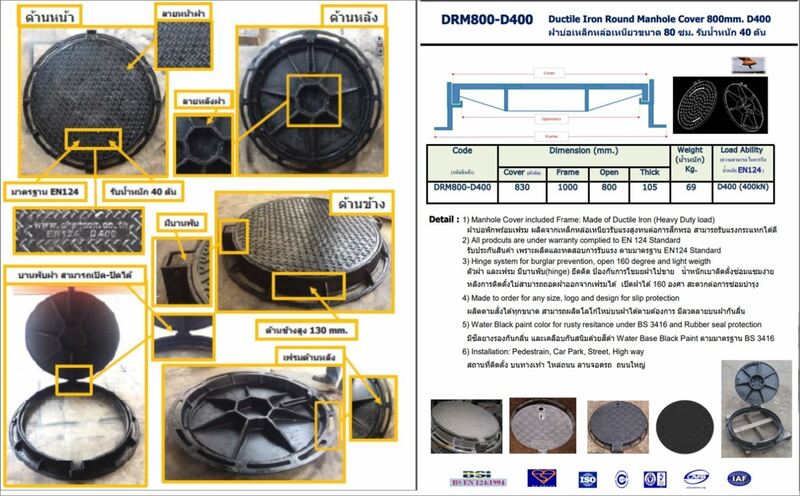 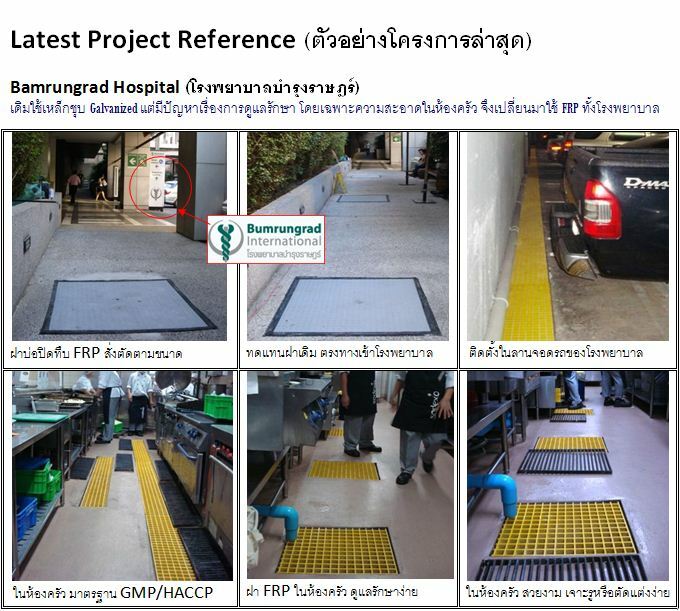 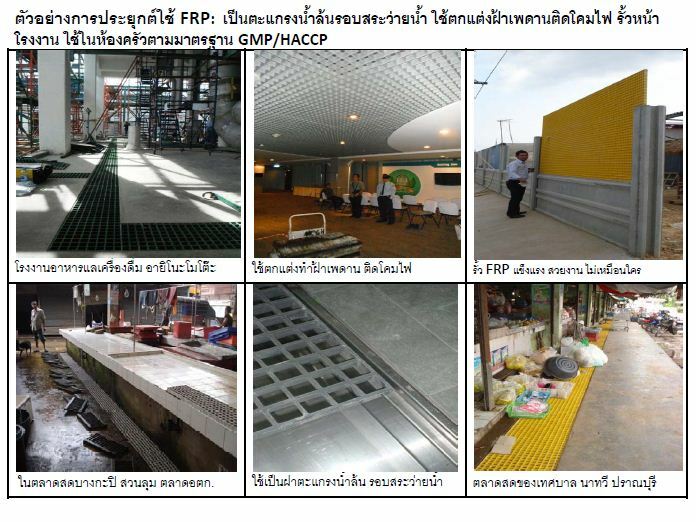 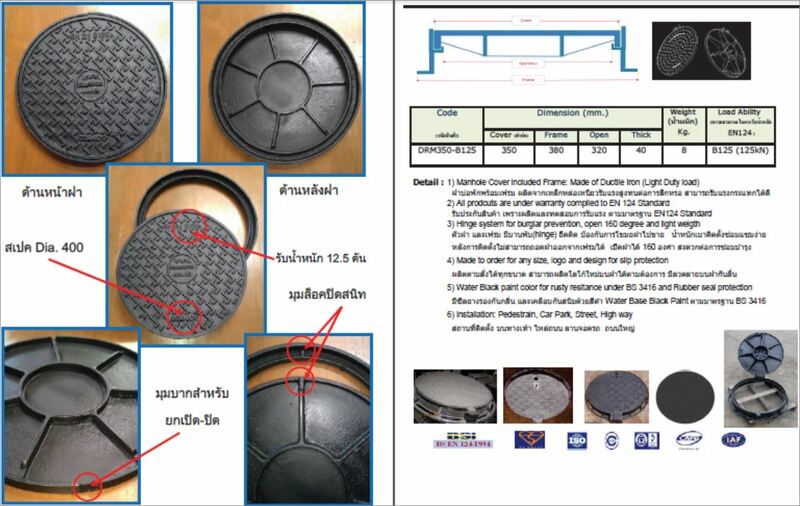 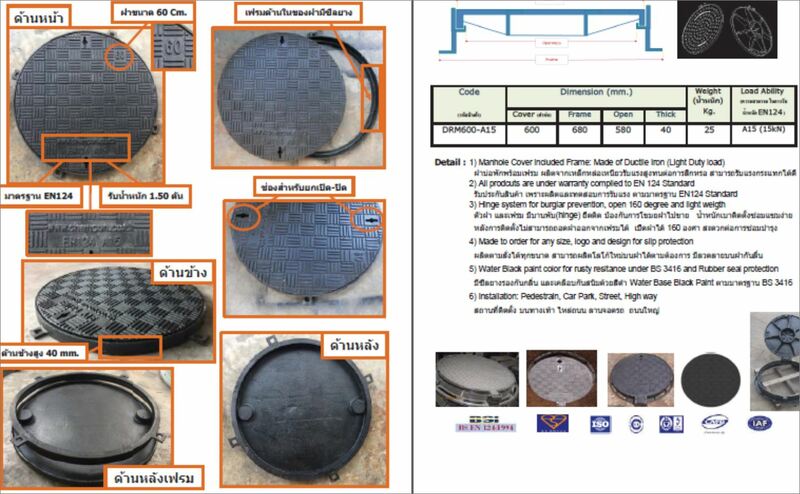 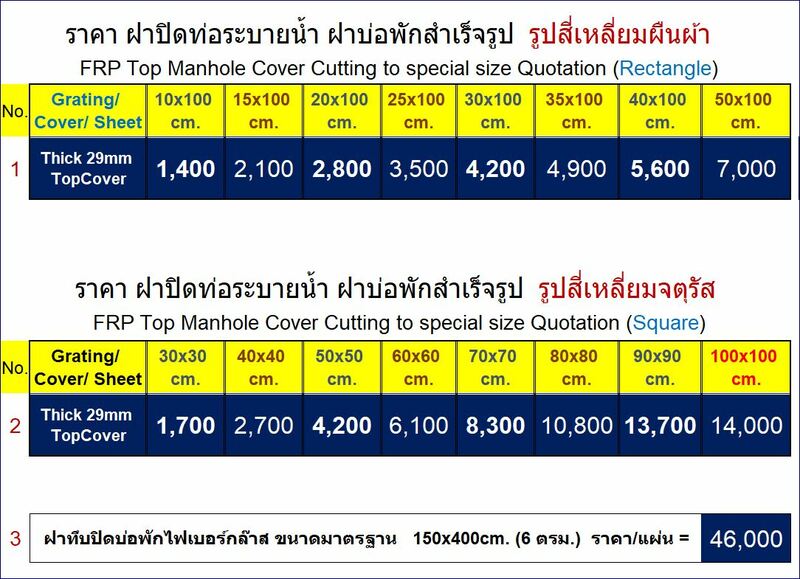 Manhole covers #ฝาปิดท่อระบายน้ำ #ฝาบ่อพักเหล็กหล่อ #ตะแกรงไฟเบอร์กลาส-ฝาบ่อเหล็กฝาท่อ #ManholeCOVER #Grating are made out of cast iron. 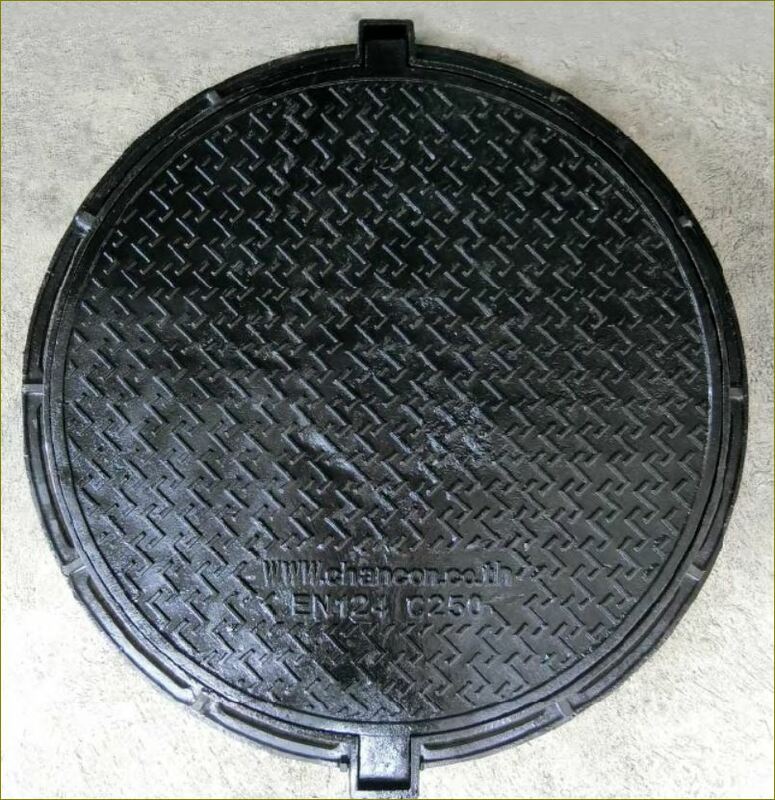 Cast iron means that the iron is melted and then poured, or cast, into a mold. 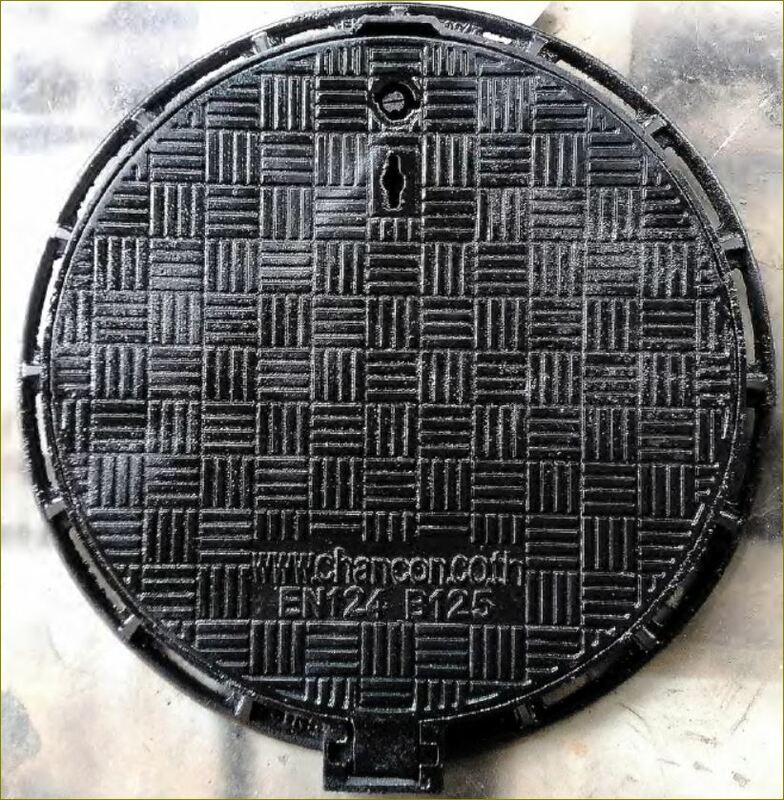 Typical manhole covers are cast using gray cast iron. 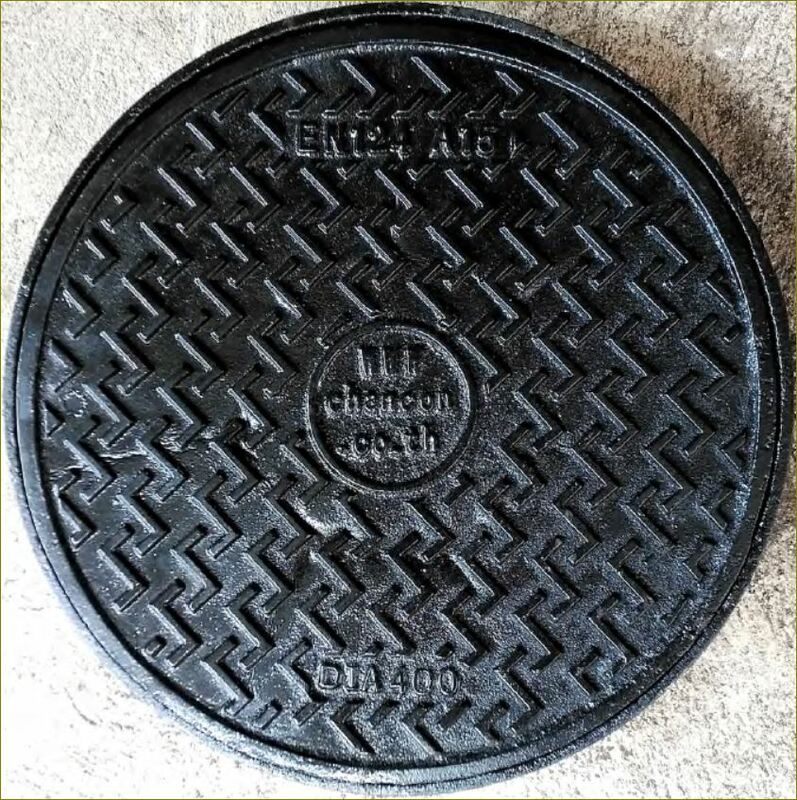 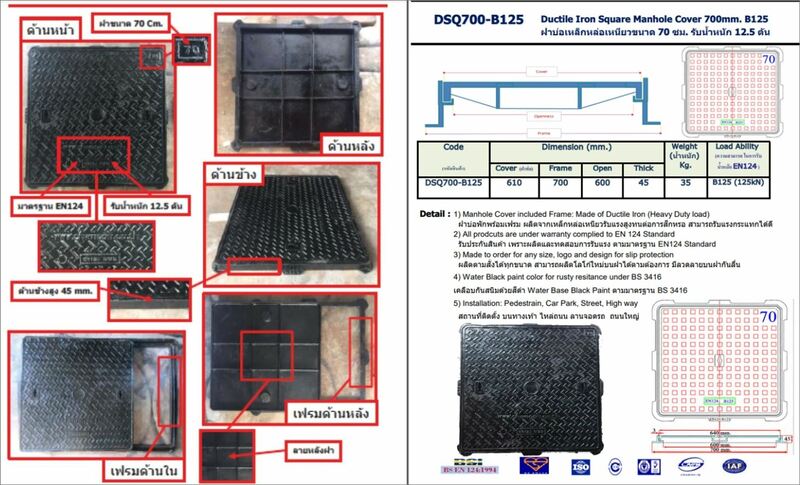 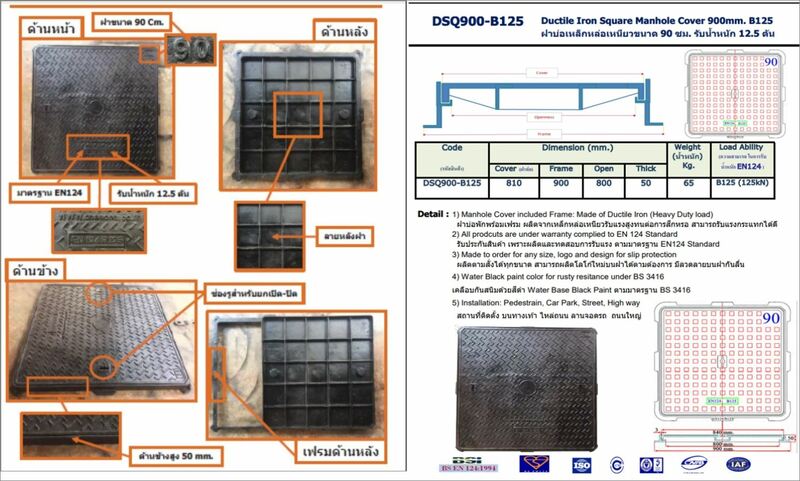 Ductile cast iron, because of its greater strength, is used for special manhole covers, like those that would be found near airplane terminals. 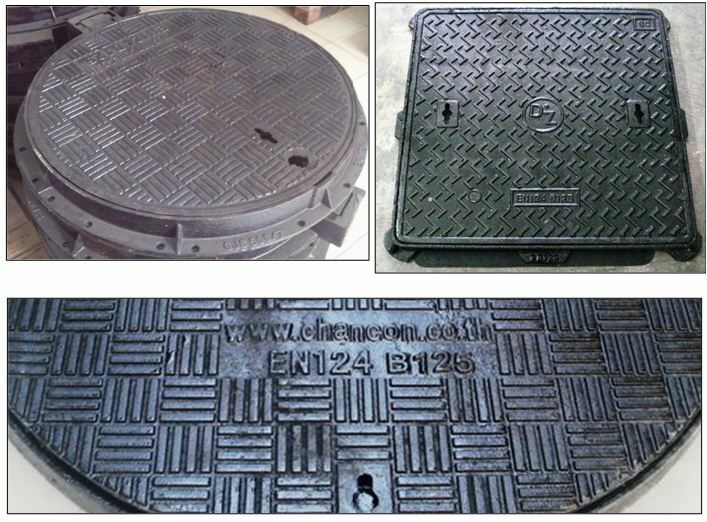 Gray cast iron consists of the element iron and the alloying elements carbon and silicon. 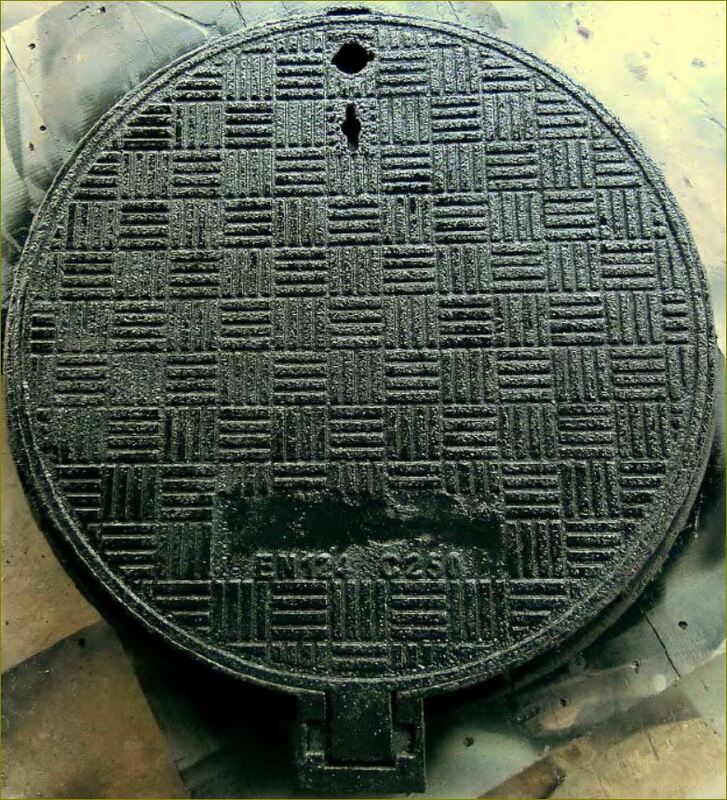 The alloying agents, chiefly carbon, give cast iron its strength and durability. 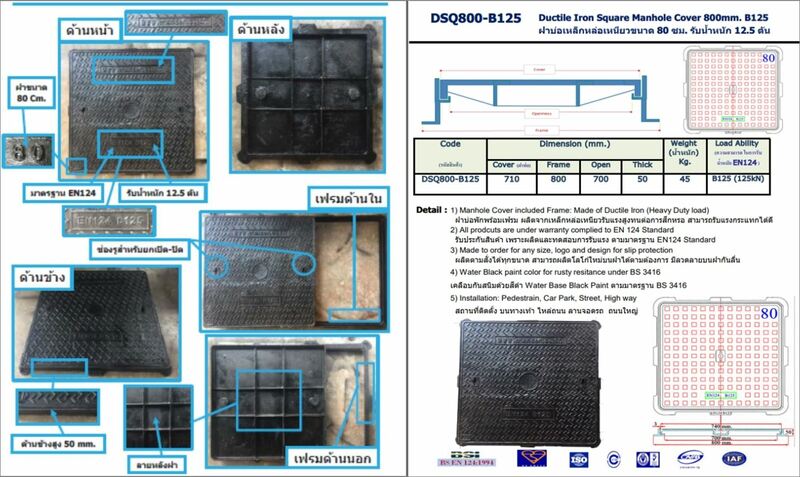 Ductile cast iron is produced by adding manganese to the molten iron. 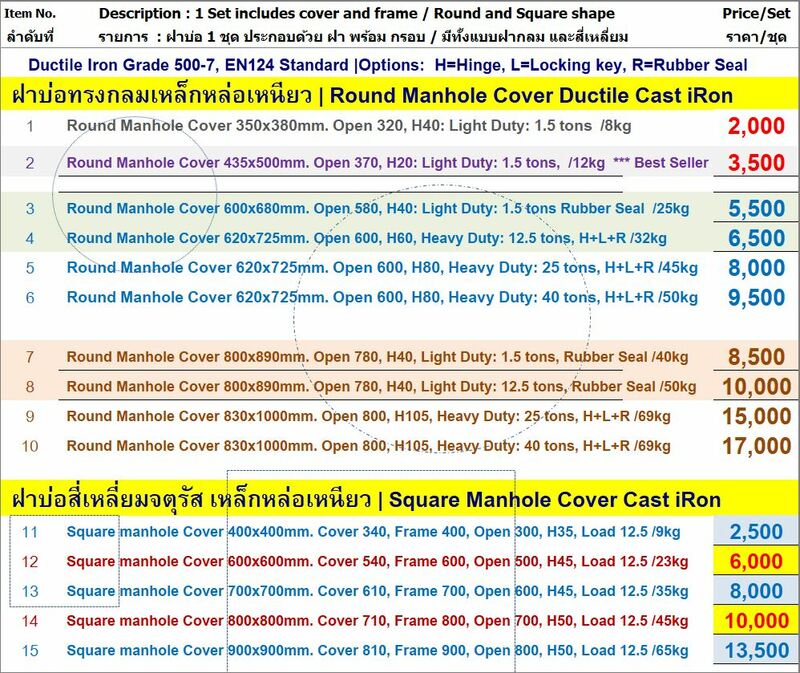 The manganese causes the carbon in the iron to form nodules instead of flakes, giving ductile cast iron its greater strength and malleability. 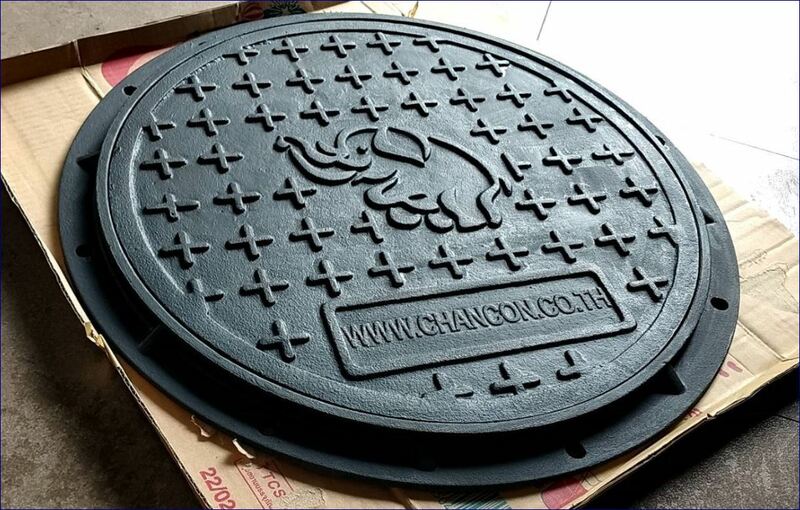 Besides iron, the other raw material required to make manhole covers is green sand, which is sand bound together with clay. 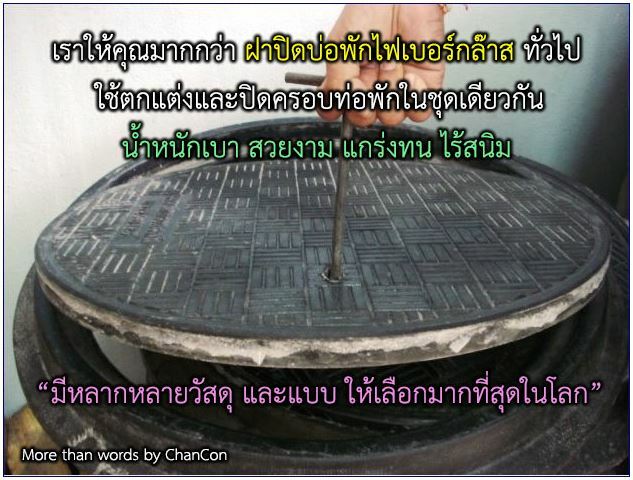 The green sand is used to produce the molds into which the molten iron is poured. 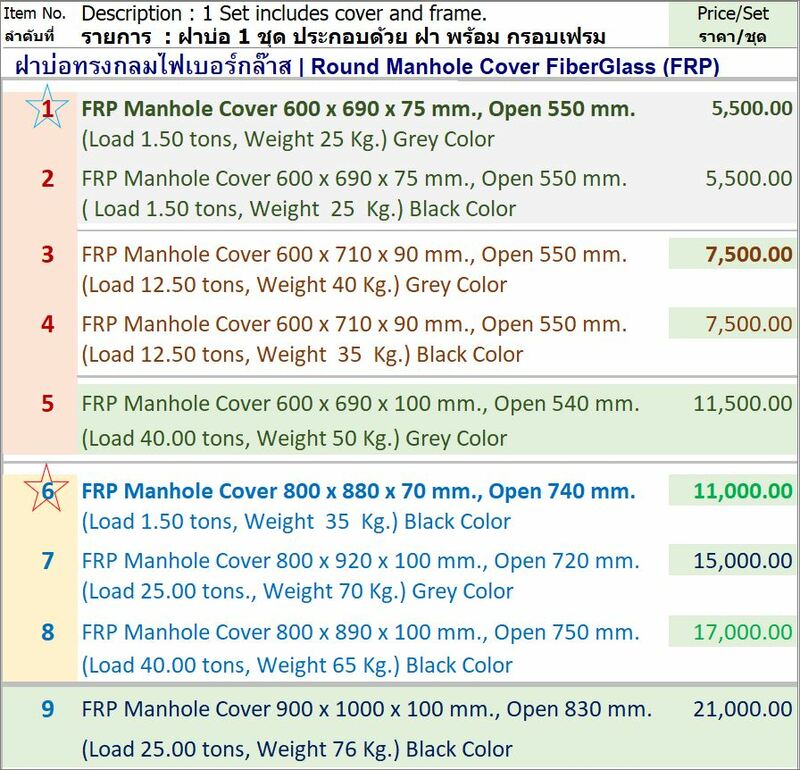 The sand mixture consists of about 90% silica sand, 4-10% clay, 2-10% organics (e.g., coal), and 2-5% water. 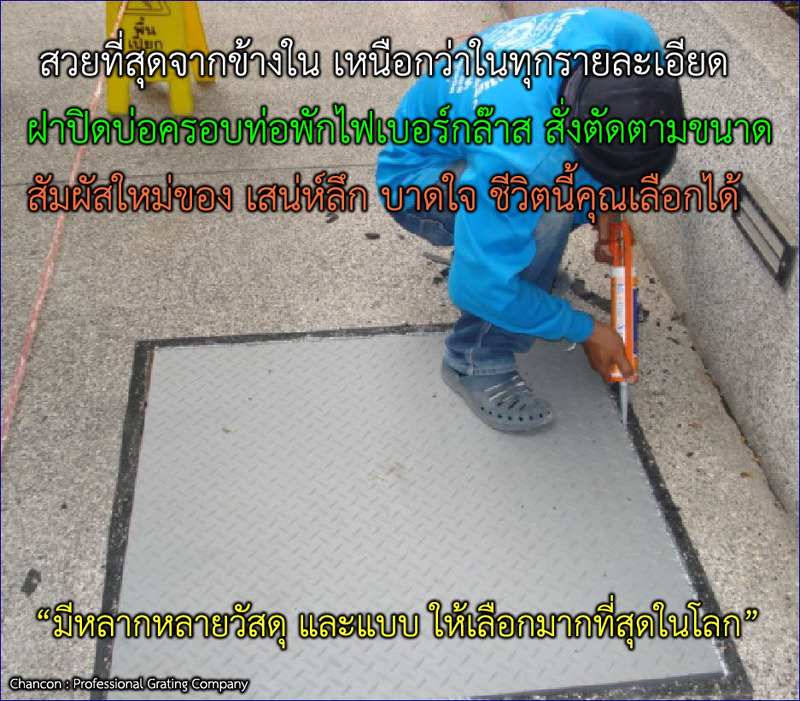 The sand is not colored green. 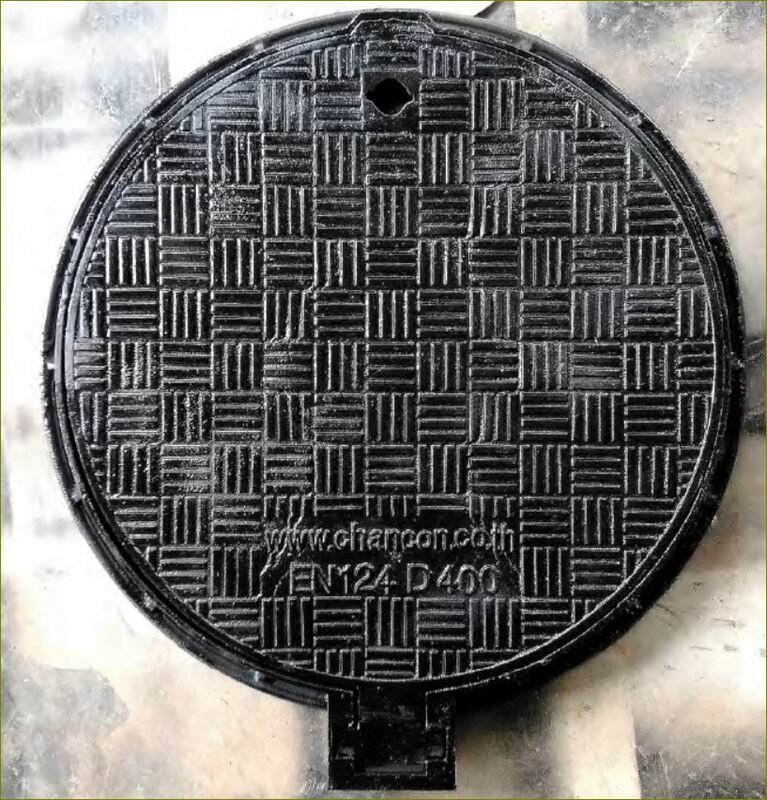 Green refers to the fact that it is allowed to remain wet during the casting process.